The Chinese language is becoming more important with the economic and political development of Mainland China. Start learning Chinese by first reading and reviewing this introduction to Chinese Pinyin. With the rise of the Chinese economy, not only have many Westerners taken it upon themselves to visit the middle kingdom, but Western countries are also playing host to greater and greater numbers of Chinese tourists, students, and businessmen. However, serious differences in language and communication styles can create an array of difficulties for a Western tourists in remote areas, let alone a Western businessperson attempting to negotiate a multi-million dollar deal. This has prompted a shift in the traditional Western English-centric model of doing business, with an increasing number of Western actively studying the Chinese language. And this is not merely limited to travelers and professionals; Chinese is being taught on an increasing basis in Western schools, and children are starting to learn at an increasingly young age.While it is true that many Westerners might never actually visit China, the odd are increasing that they may encounter Chinese citizens in their home countries. As such, it is a good idea for Westerners to be able to at least pronounce most Chinese names (e.g. a guest’s name) and be reasonably competent in several common phrases. The simplest way to start this process is learning the fundamentals of how the Chinese people speak and write. However, this is made more difficult due to the fact that the Chinese writing system is composed of ideographs (called characters in vernacular), and unlike English or other European languages, the written Chinese language has no clear link with spoken Chinese. 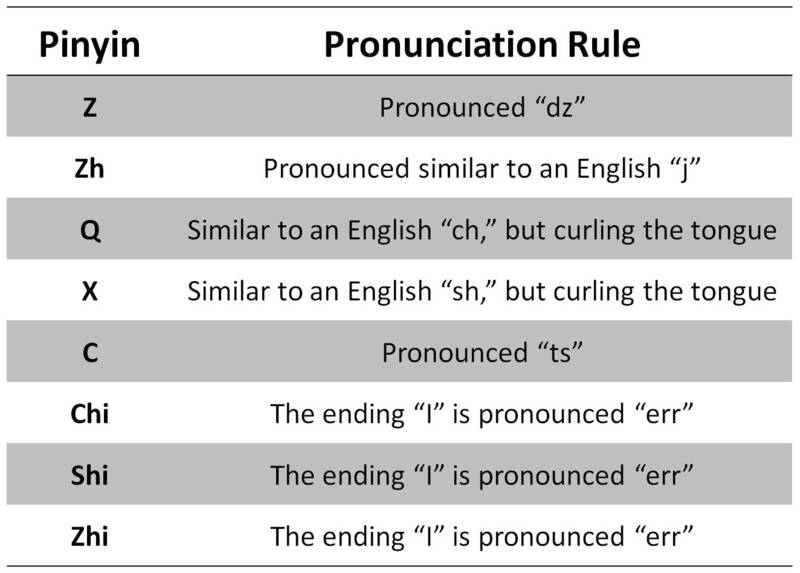 Thus pronunciations must be memorized on a word by word basis. Luckily, there is a convenient go-between for Westerners. Pinyin (literally meaning “joining sounds together”) is written with the Roman alphabet and acts as a first step in helping Westerners learn how to pronounce the Chinese language and speak in complete sentences even before any characters are learned. The following article aims to introduce the fundamentals of using, reading and pronouncing Pinyin, both for Westerners who simply want to be able to pronounce Chinese words, as well as those who plan to study the language full time. The Pinyin system in use today in Mainland China (also called “Hanyu Pinyin”) was created through a project sanctioned by the Chinese government in the 1950’s, building upon and perfecting the work of several preexisting Chinese romanization systems. The Hanyu Pinyin system has now become the most commonly used system in the world for the romanization of the Chinese language. Some regions, such Taiwan, are still know to use older systems, such as the one known as Wade-Giles, which is also still common in older Chinese history books and dictionaries. Indeed, Hanyu Pinyin is not only used by foreigners who are learning Chinese. Hanyu Pinyin also serves many purposes for Mainland Chinese themselves, including entering Chinese characters into computers as well as in aiding in language education for both children and adults. When first learning Hanyu Pinyin, it is important to be aware that this writing system contains some very specific pronunciation rules, which all must be learned beforehand in order to ensure proper pronunciation. Mandarin Chinese, the dialect upon which Hanyu Pinyin is based, possesses many sounds that do not exist in English. To solve this problem, the creators of the Hanyu Pinyin system took letters or combinations of letters from the Roman alphabet, and assigned them new and unique pronunciation rules. The chart at the right lists several examples of words and sounds which are in practice some of the most difficult to new students of the Chinese language. Mastering these new sounds is an important first step on the journey to speaking the Chinese language. For additional convenience, a link is provided at the end of this article, complete with many different Chinese words in Hanyu Pinyin and audio aids. An additional difficulty presented by the Chinese language is its tonal nature. 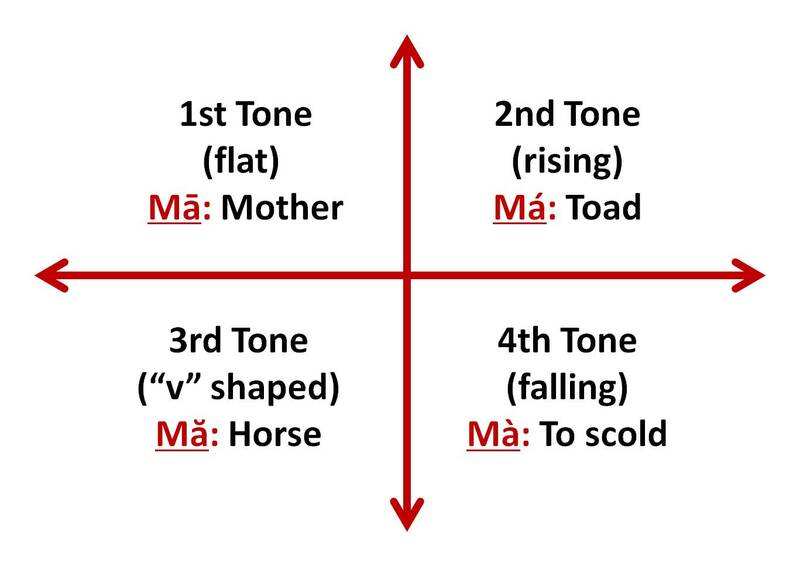 The Mandarin Chinese dialect (the national language of China) is composed of four distinct tones, flat, rising, falling and rising (or “v” shaped), and falling. In addition, different characters/words can possess the exact same pronunciation and tone but still hold different meanings. For example, while the Hanyu Pinyin word Mă means horse in the example to the left, the same word and pronunciation also means “ant” and “code.” While this sounds complex and unwieldy, within daily conversation this potential obstacle is usually avoided in two ways. First, context goes a long way towards allowing a speaker of Chinese to understand what the word “Mă” might mean at a given time. Second, despite the fact that many words or concepts can be explained or defined by a single character, in practice most Chinese words and expressions take the form of two, three, four, or more characters. A single word with a specific tone may by itself by unclear, but add a few more characters to represent a single word or meaning, and the potential meanings decrease significantly. In the case of the word “ant,” the common combination of words/characters would be “mǎ yǐ.” There are of course additional rules with regard to Hanyu Pinyin and its pronunciation, however they are not as important as mastering the basic elements described above. Now that you’ve studied the basics of pronouncing Hanyu Pinyin, the next step is practice. And the best way to practice effectively is to first listen to a specific word spoken aloud by a native (or near native) speaker, and then practice speaking aloud again, and again and again. In truth, the more you actually practice, the better you will become. An excellent and comprehensive Hanyu Pinyin chart along with audio aids is provided on the website Chinese.Yabla.com, which can be viewed by clicking on the below button. Once the chart has loaded, simply move your mouse cursor over the top row or far left column to view notes on the mechanics of Pinyin pronunciation. All complete words (in Pinyin) within the chart can be clicked to provide a clear audio example of the correct pronunciation for said word, and in all four tones as well. Best of luck to everyone! Do you have any more questions about learning the Chinese language or correct Chinese pronunciation? Any tips for would-be learners of the Chinese language? Please feel free to share your thoughts in the comments section below.